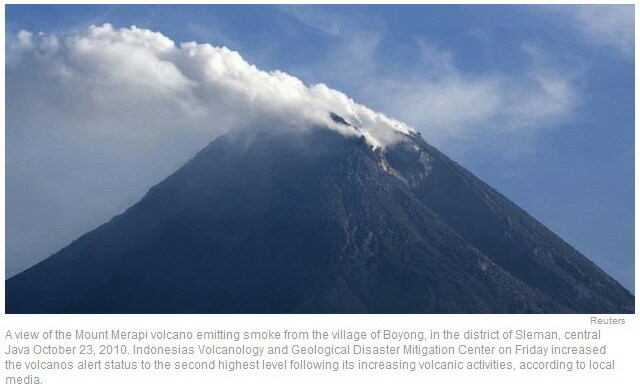 YOGYAKARTA, KOMPAS.com - Indonesia raised its alert for Mount Merapi to its highest level on Monday and ordered people living near the rumbling volcano to move immediately to safer ground. Seismic activity has escalated dramatically at the volcano on the densely populated island of Java, with increasing lava spurts and about 500 multi-phased volcanic earthquakes recorded over the weekend, officials said. The state office of volcanology upgraded its alert level to red at 6:00 am (2300 GMT), signalling an eruption could be imminent. "The magma has been pushed upwards due to the escalating seismic energy and it’s about a kilometre (mile) below the crater," government volcanologist Surono said. People had been ordered to evacuate a danger zone of 10 kilometres (six miles) from the crater of the 2,914-metre (9,616-foot) mountain. The volcano, 26 kilometres south of Yogyakarta, is the most active of the 69 volcanoes with histories of eruptions in Indonesia. It last erupted in June 2006 killing two people, but its deadliest eruption occurred in 1930 when more than 1,300 people were killed. Heat clouds from another eruption in 1994 killed more than 60 people. "It currently has more energy than before the 2006 eruption. We haven’t found strong indications that it will erupt explosively as it did in 1930 but there is still a possibility," Surono said.